Facebook has made it easier to connect with more people from all over the world. It does this by providing updates about our Facebook friends through our profile’s News Feed. Over time, our News Feed gets cluttered with posts that we don’t really find interesting. These normally come from two sets of people: those we don’t really know and those we don’t really like. Below are some easy tips you can use to improve the security of your profile as well as manage your Facebook friends in order to improve the content on your News Feed. Facebook allows all sorts of people to find out more information about you without you knowing about it. Teenagers use it to find out more about the person they will be having a date with beforehand. Companies use it to perform quick background checks on employees. In the same way, unscrupulous individuals can also access the same information to view your profile, status updates, and photos which then can be used to access your more sensitive information such as your home address, mobile number, and current location. 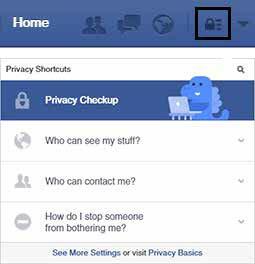 To access your Facebook Privacy Settings, click the padlock icon located at the right of the notification. From there, you will be presented with a variety of options that you can customize in order to suit your preferences regarding the visibility of your information and posts on Facebook. Facebook allows you to remain friends with that person while making sure that his or her posts won’t appear on your News Feed any longer. To unfollow someone, click the arrow located at the upper right hand corner of a post, then click unfollow name. traces of content related to that person in your News Feed. You will still remain visible to each other in Facebook’s search results in case you choose to add each other as friends once more at a later time. 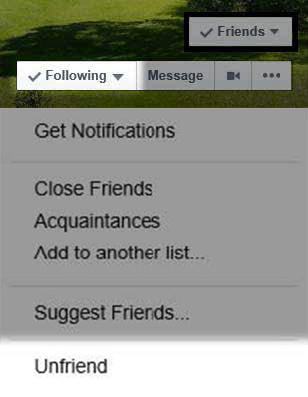 To unfriend someone, click the “Friends” button located at the lower right hand corner of that person’s cover picture. There, you can click “Unfriend” to remove that person from your friend list. Blocking a person has a similar effect but with the added feature of preventing that person from seeing your profile in Facebook’s search results, rendering you invisible and stopping him or her from adding or contacting you in the future. 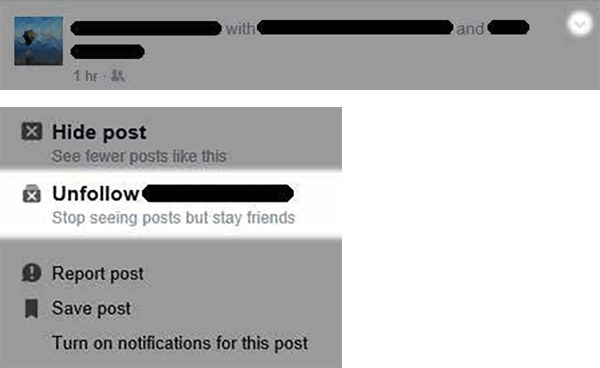 To block someone, press the “How do I stop someone from bothering me” tab in Facebook’s Privacy Settings menu (see image for tip number 1). There, you will be able to input the name or email of the person you want to block. Deleting something on Facebook does not mean that it will be permanently removed online. Everything that’s posted online will eventually end up hidden somewhere in the Internet. This is why should always be mindful of what you post on social media. In particular, anything that has a set of numbers or a bar code that relates to you in any way should be kept private. Even something as innocent as a boarding pass to Fiji can be used to meddle with your identity. Properly managing your Facebook profile and friends allows you to significantly reduce the amount of irrelevant posts on your News Feed, helping you have a safer and more enjoyable social media experience.